The founders who conjured The Grolier Club into existence 135 years ago were imbued with the spirit of French bibliophilia and devoted to the arts of the book in France. They named the Club after Jean Grolier (1489/90-1565), Treasurer of France, the greatest patron of the book arts in his era, an inspiration to book collectors then and now, deservedly known for the past half-millennium as "The Prince of Bibliophiles." They sought to raise the quality and style of printing in America by fostering well-designed and well-produced publications; they built their private libraries through Parisian agents; they had their rare books bound in France; they persuaded master bookbinders to emigrate from Paris to New York and establish the Club Bindery. The members of that first generation were generous in their direct support of the Club's collections in the book arts, so you will find collection items on display here that were donated as early as the 1880s and '90s. This generosity has motivated Club members over our many decades, and continues to do so. The program of the many hundreds of exhibitions that the Club has presented to the public from our earliest days has celebrated in selective depth the manifold arts and history of the book. A prime distinction of "French Book Arts" is that this is the first exhibition that presents a survey of so many areas of French bibliophilia, from Medieval and Renaissance illuminated manuscripts to the livres d'artistes that have been a hallmark of the book arts in France for well over a century. 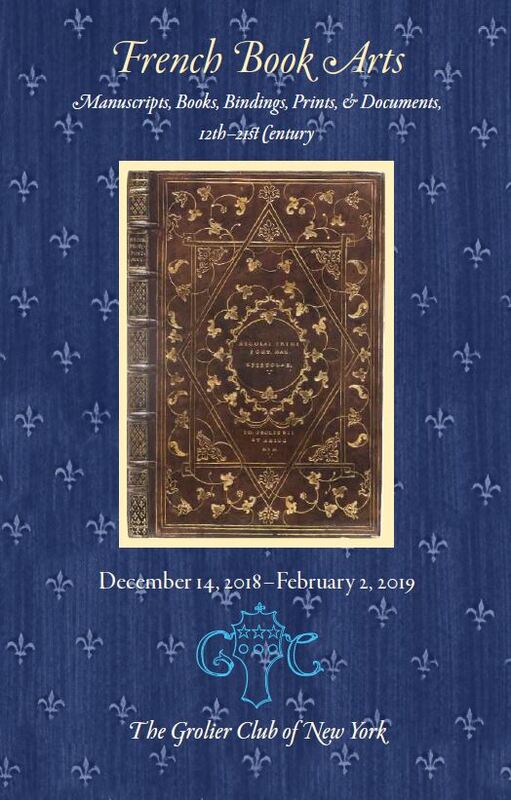 This inaugural exhibition in our new gallery and its companion volume are presented in memory of Mary K. Young, staunch Francophile throughout the life she spent in service to others, and a devoted member of the Club. Mary loved the Club, and we loved her. Curated by H. George Fletcher, December 14, 2018 - February 2, 2019.